The “SET DATE/TIME!” screen appears when you turn on this unit for the first time after purchase, when it has not been used for a long time, or when the clock is not set yet. Set the clock before recording. Tap “YES” when “SET DATE/TIME!” is displayed. “ ” and “ ” are displayed when items in “DATE” and “TIME” are tapped. Set “DATE” and “TIME” by tapping or . Repeat this step to enter “DATE” and “TIME”. 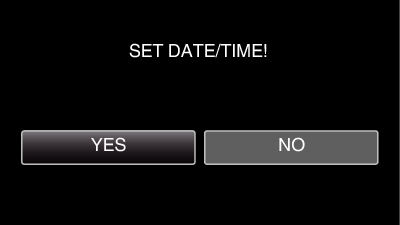 After setting the date and time, tap “SET”. Select the region where you live and tap “SAVE”. 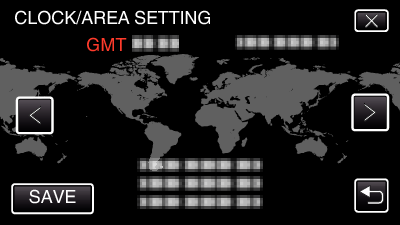 Time difference between the selected city and the GMT (Greenwich Mean Time) is displayed. Tap or to select the city name. The clock can be reset again later. When using this unit overseas, you can set it to the local time for recording. 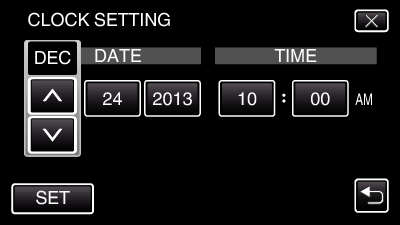 “SET DATE/TIME!” is displayed when you turn on this unit after it has not been used for a prolonged period. Connect the AC adapter for more than 24 hours to charge the internal clock battery of this unit before setting the clock.